The iconic Ausable River in the Adirondack Mountains has a storied history of rest, recreation, and even rage. The river is an iconic fishing destination, has supported major industry, produced some amazing trophy fish, powered entire towns and formed spectacular chasms. Come along while we explore these amazing waterways - a two for one deal. The Ausable River watershed drains a total of 512 square miles in the High Peaks of the Adirondacks, including three sub-watersheds. The largest of the sub-watersheds is the West Branch, which drains 236 miles. This is followed by the East Branch with 198 square miles and the Main Stem at 78 square miles. It's a large chunk of the Adirondacks (327,680 acres to be exact - about 18% of the 6 million-acre Park). The East Branch of the Ausable headwaters flow from the Lower Ausable Lake in the Town of Keene, at an elevation of 1,990 feet. The West Branch is formed by several small streams that lie in the valley to the west and north of the East Branch. This branch is formed by the merging of Marcy Brook and South Meadow Brook, both originating in the High Peaks near Lake Placid. Both East and West branches flow north and east to their confluence in Ausable Forks. At this point from the confluence, the river flows northeast through Ausable Chasm and on to its mouth on Lake Champlain. 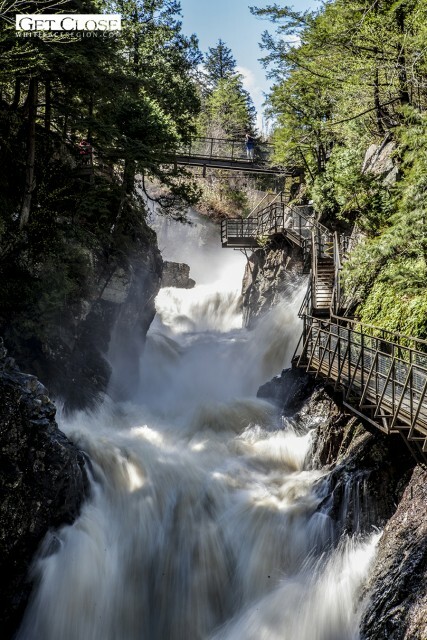 The Adirondacks are rich with waterways and the Ausable creates some of the most scenic and famously photographed and painted locations in the region. 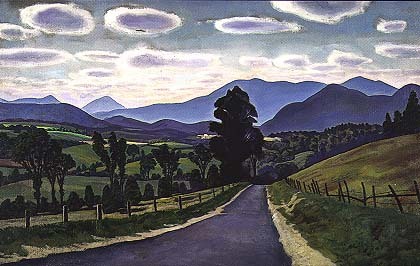 There are breathtaking vistas all along its course with some of the best being in the Wilmington Notch region on Route 86 between Lake Placid and Wilmington and also along Routes 73 and 9N from Keene Valley and St. Huberts all the way to Keeseville and beyond to Ausable Chasm. The Ausable was key to industrial development during the early settlement years. Logging, forges and mills were plentiful during the 1800’s and early 1900’s. The river was also crucial for moving logs to Lake Champlain for shipping. Some logging still takes place on private lands within the region, but nothing like the industry of the 1800’s. Many businesses in the forging industry were also the mainstay of industry in the early days of Jay, Ausable Forks, Lake Placid and the Newcomb area. Ausable Forks, at the confluence of the two branches, became a hub of lumbering and forging in the Whiteface Region. 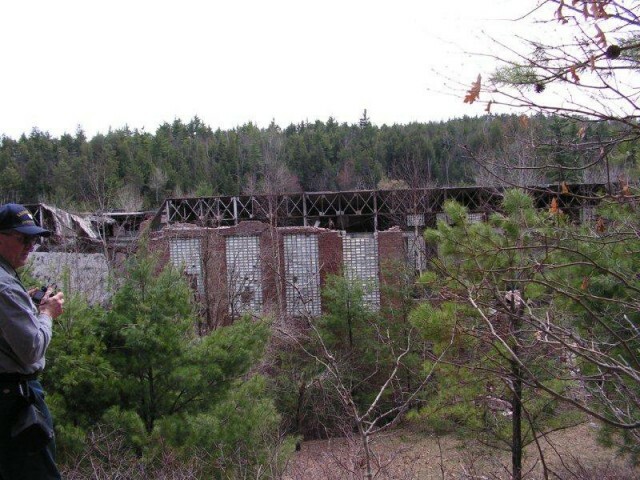 The J & J Rogers Company was foremost in the forging and wood pulp businesses in Ausable Forks. The Rogers Co. was the largest employer in Ausable Forks, with thousands of acres of holdings stretching from Jay to Ausable and beyond, and a staff to match. A sprawling compound, the Rogers forges and mills sat on the banks of the East Branch just upstream from the confluence with the West Branch. The company maintained a dam far upstream on Marcy Brook at South Meadow in North Elba (Lake Placid). Logs were stockpiled during the summer and winter months and the dam was released in the spring each year, sending floodwaters downstream and along with it the thousands of logs. James Rogers III, a descendant of J & J Rogers, told me he remembers seeing photos of logs piled high along the banks of the Ausable near the bridge at Route 86 and River Road in Lake Placid. Another dam at the Rogers Pulp Mill once generated enough electricity to power not only the J & J Rogers Company homes but the entire hamlet of Ausable Forks. Losses from raging floodwaters and several fires eventually took their toll on the company after it had been sold to another group, and it closed its doors forever in 1972. The J & J Rogers enterprises were the major economic force in the development of the mid-AuSable Valley in the nineteenth and twentieth centuries. The ruins of the mill and other buildings still sit on the property to this day. 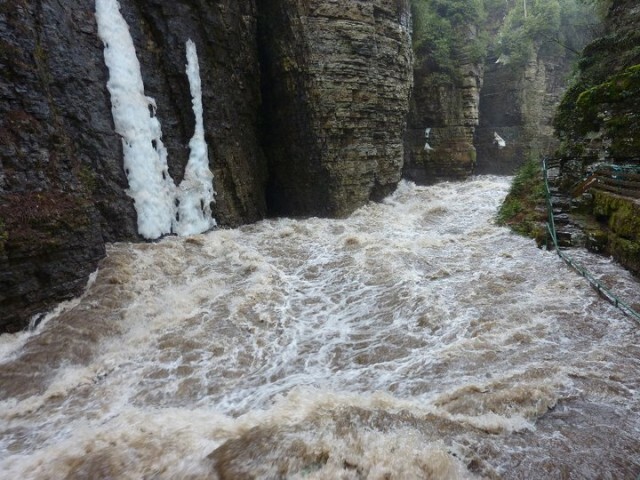 Ausable Chasm is located just outside Keeseville on Route 9. Many new adventure activities installed recently will have you rappelling down cliffs or floating along the chasm in a tube. Their new Adventure Trail explores the Upper Chasm via Tyrolean (cable) traverses, cable bridges, cargo nets and edge walks. In addition, the Chasm’s traditional tours are still available for the less adventurous via walkways and stairs. Winter tours are also spectacular with a more limited terrain than the summer tours. High Falls Gorge sits in the middle of the Wilmington Notch and is a spectacular attraction, with walkways along the river and views of the 100-foot High Falls and other smaller falls. This 22-acre nature park provides safe trail access to an area otherwise unaccessible. The Gorge is comprised of walkways (some with glass floors!) along the river, nature and hiking trails for both summer and winter (snowshoeing is great here in winter) and sturdy bridges, providing safe access. Cascading over crevices created a billion years ago, the views are spectacular and winter provides an even more magical experience. Along the entire length of the rivers fishing is excellent, with two legendary stretches of river between Lake Placid and Wilmington being designated catch and release, with flies only and no live bait allowed. They are designated as “no-kill” sections of river. The river is widely acclaimed as the premier trout stream in the East, a fly-fishing paradise. Fly-fishing vacations are best planned between the first week in May into the middle part of July, and again from the end of August until mid-October, when the fishing is at its best. Of course, fishing can be done any time during the middle part of the summer, but the trout are fairly sluggish when the water temps rise during the hottest part of the summer. The plentiful trout in the trophy sections include brook, brown, rainbow and an occasional “par” salmon. Trout fishing in the other areas of the rivers include brook and brown for the most part. Rainbows are stocked in the trophy areas and don’t venture far upstream from there. Paddling along the Ausable is good in some sections, although its rocky, shallow configuration isn’t conducive in many areas. From a steel bridge on River Road in Lake Placid to the bridge at Route 86 is good early in the season when the river is swollen with spring runoff and you’ll get a wild ride during this high water time. Another section downstream from Ausable Chasm and running north to Lake Champlain, is classified class III-IV+ whitewater. There are spots here and there where you can put in and paddle a ways, but be aware the river becomes very shallow in many places during mid and late summer. Tubing is awesome on most stretches of the river. Grab an inner tube on a hot summer day and take a lazy float downstream. Leaving a car at each end of your chosen route makes for longer floats. Swimming holes abound, with two of the more famous being right here in the Whiteface Region. The Flume, just past the bridge near Hungry Trout Restaurant in Wilmington is one. The other is at the old Covered Bridge in Jay, where huge smooth rocks allow for sunbathing and sliding into the water. Be extremely aware of high water in any of these areas. High water after storms or during spring run-off is both beautiful and very dangerous. Swimming in the Ausable during high water events is not recommended. Raging waters of both branches of the Ausable have caused extensive and historic damage several times over the course of history, but that’s a story for an entire blog post of its own. A few very noteworthy events follow the Ausable’s two branches. Ironman Lake Placid’s bike and running routes follow alongside the Ausable in Keene, Jay, Ausable Forks, Wilmington and on toward Lake Placid. It is widely proclaimed the most scenic of all US Ironman courses, and takes place July 26th, 2015. 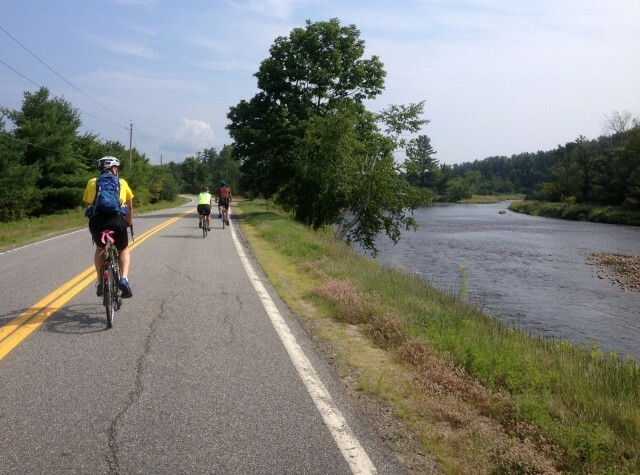 The Ride for the River is an annual cycling event, taking a course alongside the Ausable from Keene, Jay and into Ausable Forks and beyond. Ride for the River is a fundraising event to benefit the Ausable River Association’s conservation efforts. This year’s ride takes place August 2, 2015. In May, Wilmington hosts its annual Two-Fly Challenge - a fishing tournament in which anglers can use only two flies (chosen in advance) over the two days of the tournament. This year's Two-Fly Challenge falls on May 15 and 16, 2015. 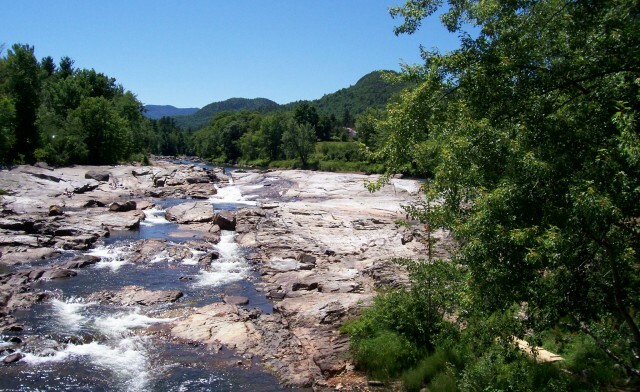 The Ausable Rivers are iconic symbols of both the wild and civilized sides of the Adirondacks. Man and wilderness coexist in harmony side by side in the Northern Adirondacks where the two Ausables flow. Famous artists have painted and photographed them and millions have fished, waded and swum in their waters. You'll also find some spectacular fall foliage along both branches in late September, making for some memorable drives and iconic views of Whiteface Mountain and the surrounding mountain ranges. You, too, should come and see why we are in love with these two rivers. 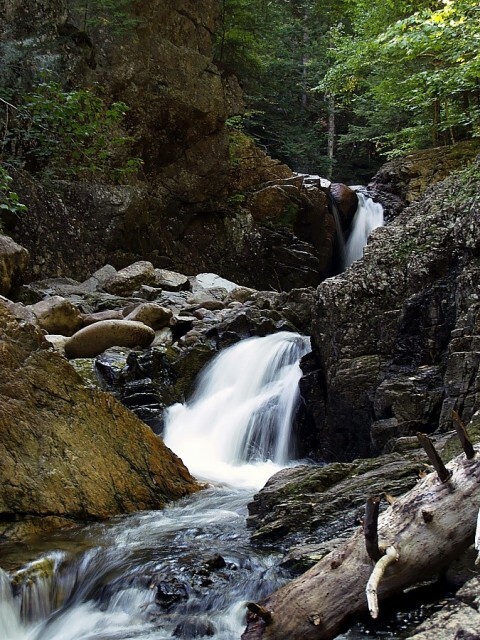 Plan a visit to the Whiteface Region where you can get close to the Ausable in all seasons. There are lots of lodging options as well as recreation including skiing, snowshoeing, mountain biking, road biking, hiking, fishing and much more. Check out our events calendar for many more event listings.